Your generosity is worth celebrating! Your generosity is worth celebrating! As we approach the holiday season in Canada, children and their families and communities around the world are benefiting from your generosity. And we believe that’s worth celebrating. Children know they can count on healthy meals at school, families have learned how to earn more income, and communities have become more resilient to poverty - all thanks to you. As you read this edition of thrive!, you'll hear from sponsored children around the world who have been given so many things to celebrate this year. 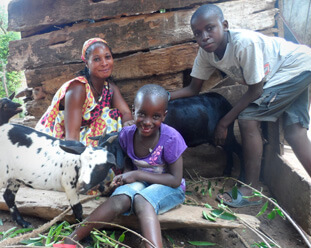 You'll see first-hand how the gift of a goat helped Florence in Uganda transform her children's lives. And, you'll read about how your monthly gifts are helping good food take root in Indigenous communities in Canada. We hope that the stories we share in this digital edition of thrive! uplift you during this season of giving and generosity. thrive! is Canadian Feed The Children’s semi-annual newsletter, written specially for you. We connect you with the children, families and communities in Canada and around the world who you help through your generous support. It couldn’t be done without you - thank you! Want to read more? Sign up for our monthly e-newsletter to learn more about the impact of your gifts and other ways to help, sent conveniently to your inbox. Immaculate dreams of becoming a nurse. You’re helping her get there. Immaculate’s parents couldn’t grow enough food to take care of her. 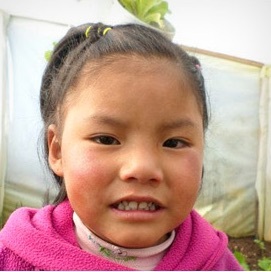 Then she became a sponsored child and it changed everything. Sponsored children’s best memories from 2018! You have helped give children so many things to celebrate this year. Hear from them about what brought the most joy. Monthly giving helps make community solutions possible. Read three stories about your impact. When you give the Best.Gift.Ever you transform families. Hear directly from Florence about how a goat changed everything. 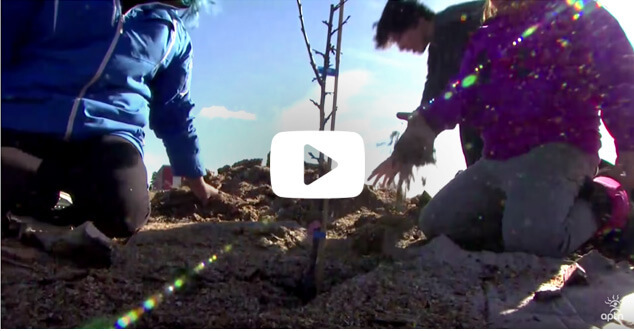 From culinary arts to planting an innovative food forest - big things are happening in Canada. 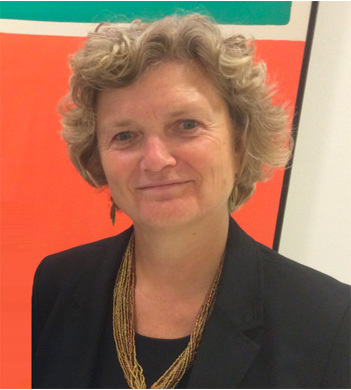 Jackie Wright, CFTC's new President & CEO has deep expertise in international development. But we wanted to introduce you to her "non-professional" side. Check out what’s new in the Best.Gift.Ever Catalogue and get a special sneak-peek of Giving Tuesday matched gifts! Choose a holiday social media banner to add to your profile. Share the impact you’re having on children’s lives with your family and friends! Plus, you can help us spread the word by sharing this edition of thrive! 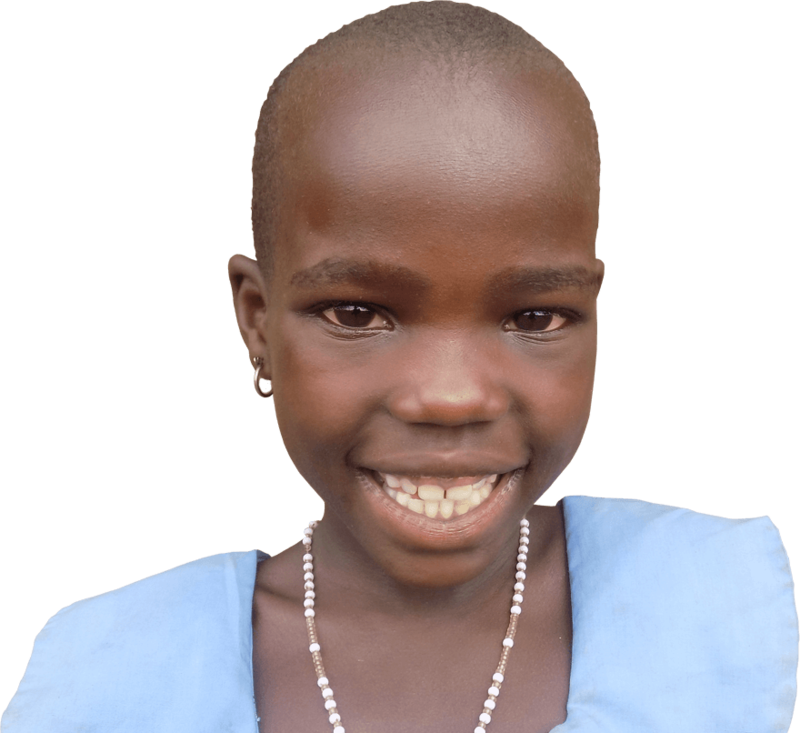 When I grow up I want to be a nurse, so I can help treat sick people in my village. I like going to school because my teachers love me and teach me well. I like counting numbers. When I go to school I get to eat porridge. My mama also sends me with cassava and potatoes from our farm. My mama says that my skin looks better now that I eat healthy porridge at school and my parents learned how to grow more food. I help my mama carry the vegetables that she harvests from our garden. I also keep the fire burning, fetch water for my family, and help with other chores. 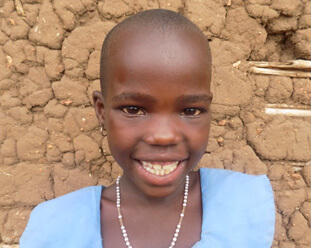 My mama said that she is going to teach me how to cook vegetables one day too.” Immaculate, sponsored child, aged 8. 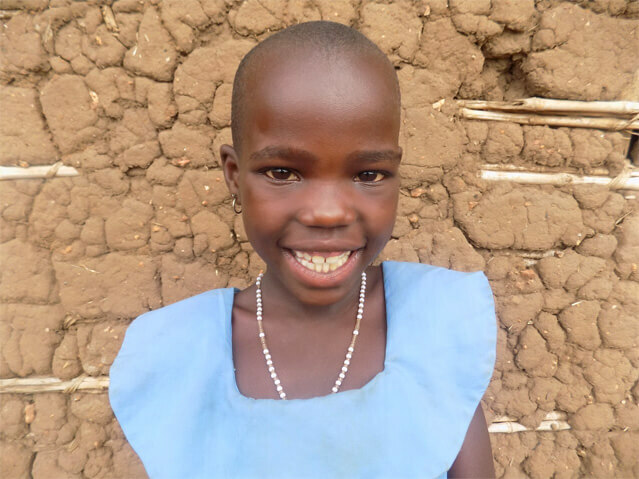 Immaculate is growing up in a small village in Uganda that is located between a rainforest and a large sugarcane plantation. Together with her mother Jane, father Bosco, and four other siblings, Immaculate lives a happy life dreaming about her future. 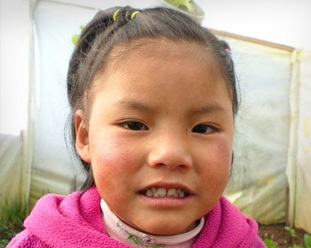 But like many children living in poverty in her community, her family faces many challenges. Despite working hard, her parents would sometimes come up short during harvest. That meant they often couldn’t afford to feed their children and sell enough at market to earn an income to provide for other necessities like school fees. To make matters worse, the nearest school was four kilometres away from their home. 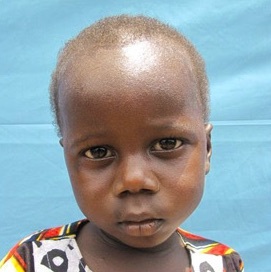 The distance was too far for young children like Immaculate to walk to safely on their own. So families often kept their children at home until they were old enough to walk alone. 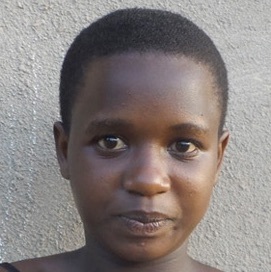 Then Immaculate became a sponsored child - and it changed everything. Immaculate’s mother Jane and father Bosco were given training on a ‘farmer field school’ where they could practice new techniques such as applying natural fertilizer and spacing out crops to increase their yield. They also attended workshops on nutrition and learned about the importance of a balanced diet for their children. And did it ever make a difference! 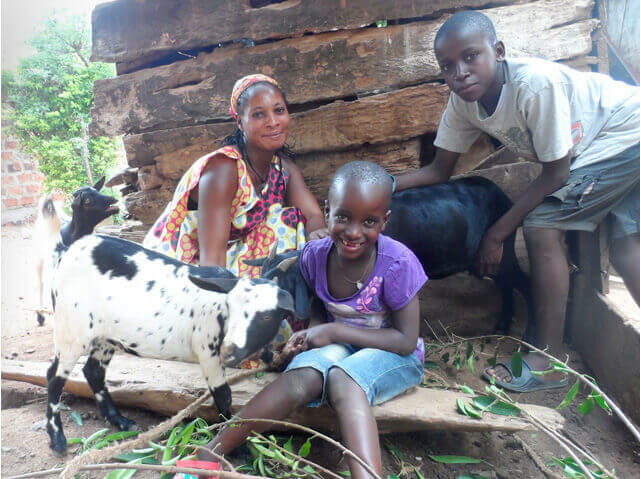 After applying these new techniques, Immaculate’s parents more than doubled their harvests on their land. Now they grow enough to sell at market and provide their family with healthy food for several months at a time. With the support of donors like you, Canadian Feed The Children worked with local partner CEDO to build a new school closer to her community. Parents like Immaculate’s helped contribute what they could to the project too. 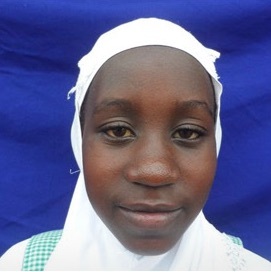 “With the introduction of the community school supported by Canadian Feed The Children, CEDO, and the parents, Immaculate and my other children are now attending school. I do not worry about their safety anymore because it is nearer to my home,” Jane explained. Thanks to the support of generous Canadians like you, Immaculate and Jane’s dreams can both come true. You've helped give children so many things to celebrate. KEEPING GIRLS IN SCHOOL. PERIOD. make sanitary pads for her peers. Keeping girls in school is a big dream for a 15-year-old, but it’s one that Saluwa is helping to make possible one sanitary pad at a time. Girls like Saluwa are learning how to produce their own pads through a new initiative funded by Canadian Feed The Children through local partner UCOBAC. The initiative is designed to combat the high rate of adolescent girls who miss or drop out of school in Uganda because they don’t have the supplies they need. Along with private latrines built with support from donors like you, Saluwa’s school is well on its way to keeping more girls in school. Every parent knows how special it is to find someone that cares for your child as much as you do. For the moms and dads of very young children in this Bolivian town, they’ve found that special person in Andrea, their Early Childhood Educator. 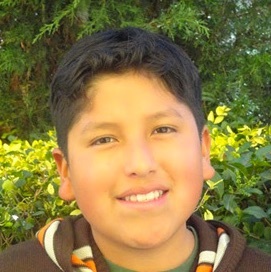 24-year-old Andrea has worked at the Early Childhood Development Centre in La Barranca, Bolivia for five rewarding years. In that time, she’s become a warm and loving mother figure to many of the community’s children. In her community, many parents work long hours in nearby towns, and without the Early Childhood Development Centre, there would be no where for their children to go. The first five years of life are a crucial growth period, where access to good nutrition, education and a safe, enriching environment can make all the difference in creating a healthy future for a child. It’s a dream that Andrea shares with parents around the world that you help make possible – a bright future for their children, no matter what. 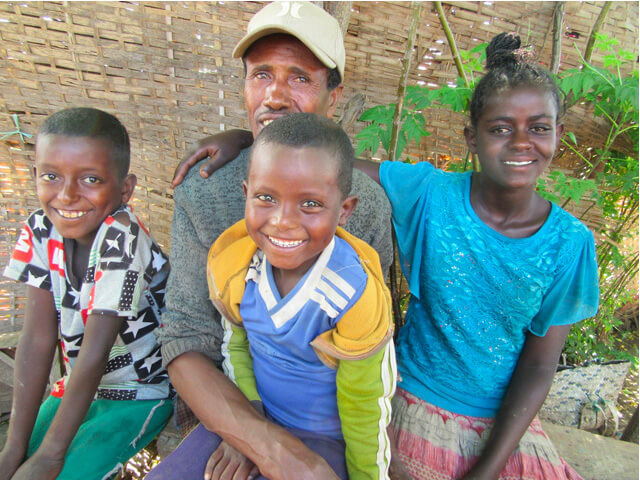 Ashenafi is raising his three children together with his wife in Bora, Ethiopia. It’s a community that faces many challenges: “We have problems with clean drinking water, our roads are poor and we cannot sell our produce at markets, and we do not have sufficient schools,” he explained. Thanks to the support from donors like you, Canadian Feed The Children is starting a new partnership with the Bora community. And parents like Ashenafi are leading the charge. It’s part of Canadian Feed The Children’s commitment to community-led development. Ashenafi has many plans - and some have already started. The community planted 450 tree seedlings at the local school, and they are working to develop a farm together so it can be used as a model for their community. “To change our life we need to take our own action first by working together. I will continue participating and work with others to bring about change,” Ashenafi promised. After my husband lost his job as a fisherman, we suffered as a family. We used to plead with the school not to chase our three children away when we were behind on fees. We were struggling - and that’s when you came in"
At the time, I lacked basic knowledge about farming. Both for caring for animals and growing crops. I tried to learn on my own by asking neighbours for advice and listening to radio shows, but then Canadian Feed The Children’s local partner HUYSLINCI offered me training in caring for domestic animals and maintaining a vegetable garden. Because of you, I received my first goat. I learned that animals need space that is well planned and maintained. I was taught how to properly feed them, and to identify disease and illness and how to treat them. Plus, I learned how to use farmyard manure for my garden, which helps keep the soil fertile. HUYSLINCI also taught me the importance of saving and borrowing, and to not sell my animals if an urgent need arises in our household. These days I spend most of the time looking after my animals. I also grow vegetables for us to eat and sell and I am so happy that you helped give me those skills. I am proud of the way my little farm is expanding. I have successfully bred my goats and now have nine of them. We also have two pigs, 45 rabbits, and seven ducks. As a mother I have encountered a number of financial challenges. Although we are not there yet, the animals have provided me with an income that gives me hope that our children can continue attending school, receive medical care, and have clothing and nutritious food. I know that you could have chosen to use your money on anything else and to not give us these goats. I also know that there are more families that need such help. I therefore think the same spirit of giving has to continue and I will do so by giving a goat to another needy family in my community. It feels good. It makes us feel that we can help one another to improve our livelihoods. Look at my children (placing her hand on her daughter), they look good….but do you know why?... it’s because of you. You taught us the importance of vegetables and how to grow them. These shining skins are a result of the greens that we eat almost every day. We balance our diets, we know how to prepare meals through the food preparation and preservation classes that you gave us. I will tell you that even food wastage has reduced - we only prepare what we shall consume and not to recycle food, which we sometimes used to throw away. Because of my work with the domestic animals, my children have learned how to care for them too. I have given each of them responsibility of caring for one goat each. In a way, they have learned a lot of skills because I guide them. 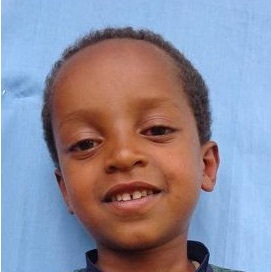 My son Mulema wants to become a veterinary doctor to treat animals now. He says that he doesn’t want any animal to die. When Colton enters the kitchen, his love for cooking comes alive. He proudly dons a white double-breasted chef’s jacket, employs knife-cutting and cooking techniques, and helps to manage the line. With the smell of onions sautéing and the swiftness of vegetables being chopped around you, you could easily be convinced you were sitting in a five star restaurant in Winnipeg’s Exchange District or at the Forks. And while you very well may find Colton in a five star restaurant in a few short years, today at age 16 he’s learning the skills he needs in a culinary arts course with his peers. 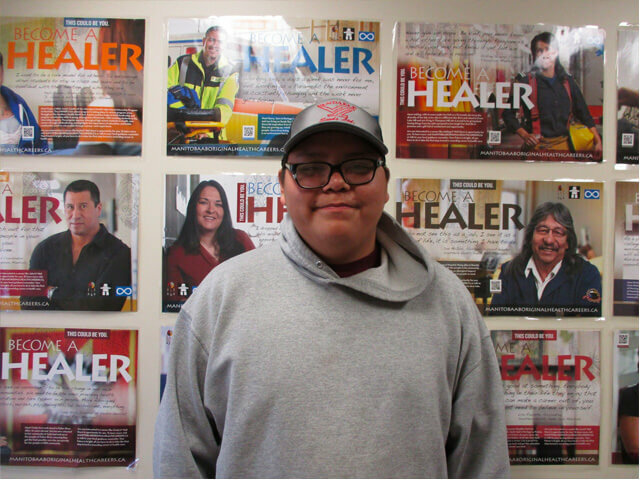 He’s been attending the unique course offered through Waywayseecappo First Nation’s off-campus program. This past year, Canadian Feed The Children partnered with the community on this initiative for Indigenous youth. Colton has learned a lot from his teacher Drew Van Landeghem who helps guide the course. Van Landeghem is a grade 9-12 teacher at Waywayseecappo Off-Campus through a partnership with Park West School Division. The flexible off-campus program, which aims to create a positive and rewarding space, allows students to join the sessions when it works best for them and earn a nutrition credit while learning. “Before I went to culinary arts, I didn’t know how to cook for myself actually. It’s helped, because at home I didn’t know how to cook this or that,” Colton told us. The Muskeg Lake Cree Nation hopes its new food forest will provide healthy food for its community. 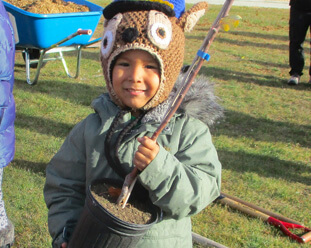 Earlier this week, Muskeg Lake Cree Nation marked its new food forest partnership with Canadian Feed The Children as community members planted apple trees, berry bushes, and a variety of complementary trees to attract birds and pollinators. The food forest has been designed using innovative permaculture design, which will help provide greater and sustainable healthy food access for the community. Along with the partnership, the food forest is funded in part by the Slaight Family Foundation and the Newall Family Foundation. The community-led initiative was designed with support from Steven Wiig from Holistic Landscape and Design, who promotes a nature-inspired design system known as permaculture. Permaculture is founded on lessons observed in nature and from traditional practices, which have evolved into three core ethics and 12 design principles that can be applied to create systems which support nature, while providing for community needs in a sustainable and regenerative way. 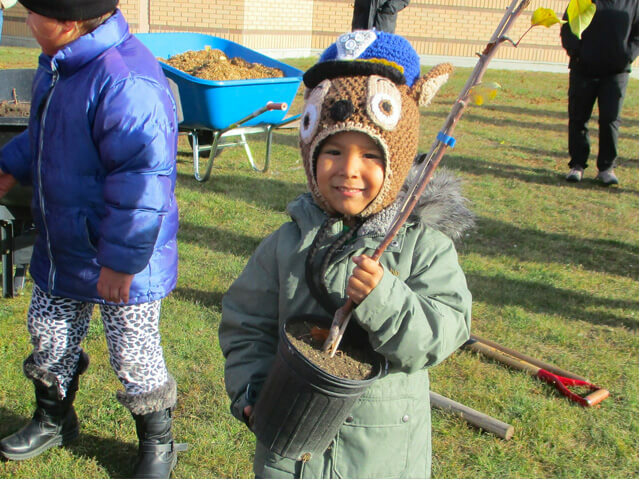 Muskeg Lake’s food forest will include apples, berries, pears, plums, cherries, Saskatoon berries, strawberries, raspberries, cranberries, sea buckthorn, and haskaps. There are future plans to include a playscape for children, walking trails, an Elder’s gathering area, a year-round solar and wind powered greenhouse, water catchment, outdoor cooking with cobb oven, and compost site. 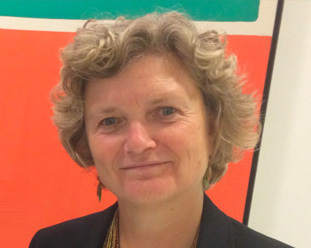 If you’ve had a chance to ‘meet’ Jackie Wright, CFTC’s new President & CEO, you know about her deep experience and expertise in international development and humanitarian work. But we wanted to introduce you to another side of Jackie, so we asked her a few questions about her “non-professional” life. Q. Where did you grow up and what was it like? I grew up in Calgary, AB where the population during my childhood was around 400,000 people. I like to say that the Rocky Mountains were my backyard and that is really where I grew up. We had a cabin in the foothills and I spent a lot of time outdoors, riding horses and playing outside in the treehouse, the barn or anywhere we could find an adventure. In my teens, I joined the YMCA and spent countless hours hiking through the mountains or exploring the rivers by canoe. The thing I remember most about the city is the annual Calgary Stampede where a million people attended the “Greatest Outdoor Show on Earth.” This is where I began to be exposed to Indigenous culture but did not yet understand how the settlers, in this case cowboys, shaped our country – and not in a good way. Anything in the outdoors – walking, hiking, canoeing, just being one with nature. I love to read and to learn, to be with my friends and family, and spend time in reflection, writing out my thoughts and feelings. I am passionate about human rights, equality, justice and the environment and being immersed in a culture and place not my own. I believe in co-creation, peaceful solutions, and collaborative approaches and am always looking for the positive. I love to laugh, exercise, be peaceful, meditate and do yoga. I love animals and have had many dogs in the past and now have a beautiful black cat named Harmony. I love my son with all my heart and soul and hope that he is successful in whatever he chooses to do. Q. What's your favourite type of cuisine? Honestly – anything that is healthy. My body craves it and I feel so much better and have more energy when I have it. I love Asian food, especially Thai, and being from Alberta, I still really love a good BBQd steak! Q. What was the last book you read that left an impression? There are too many to pick….the last one would be “The Marrow Thieves” by Cherie Dimaline. This author won a Governor General’s Literary Award for this book which portrays a fictionalized dystopian future world but conveys teachings from what is all too real about our own world in terms of global warming and the situation of our Indigenous Peoples in Canada. A heartbreaking and important story. This year’s Best.Gift.Ever catalogue has some new gifts that can make a big impact on the lives of children and their families around the world. 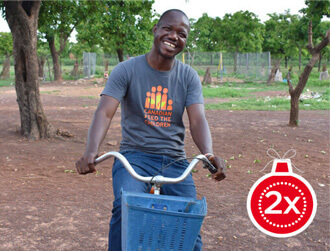 A bicycle will help community agricultural workers visit farm families in their area to provide them with tips, tools and training to enhance agricultural skills. 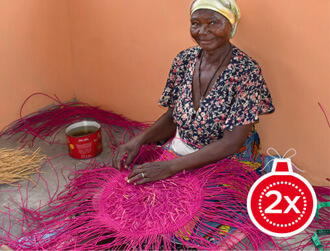 Supplies for Ghana’s artisan basket makers help women earn an income close to home and set their families up for success. Help grow an orchard in an Indigenous community and support families to reclaim their culture and traditions around food. Tuesday, November 27th is Giving Tuesday. These gifts, and many more, will be matched 2:1 by generous Canadian donors. 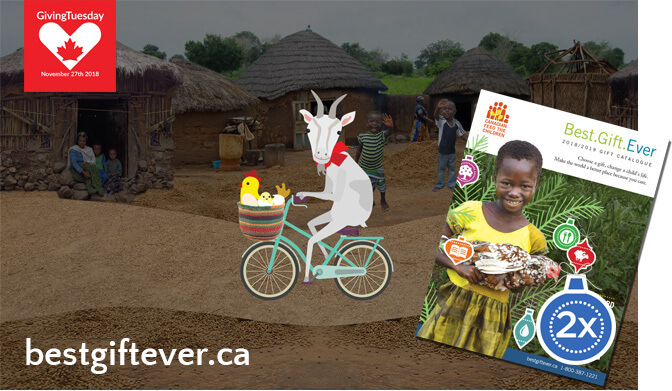 A little can go a long way for families in Canada, Bolivia, Ethiopia, Ghana and Uganda. Browse previous editions of thrive!